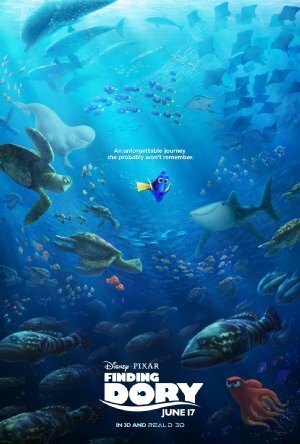 A year after the incredible journey to find Nemo, Marlin, Dory, and Nemo, set off from the safety of the coral in search of Dory's long lost parents. Finding Dory shattered opening weekend returns for an animated film with over 136 million. How Sigourney Weaver and Ed O'Neil ended up in Finding Dory. It made me laugh, it made me cry, it made me want an otter cuddle party. My favorite element: its star has a significant disability. Dory is disabled. It hurts her, it affects every aspect of her life, but it doesn't undermine her value. She's good, she's capable of plenty, she's as loved as everyone deserves to be. She just, you know, needs help in some ways other people don't, but that's okay. Finding Nemo is our family's favorite Disney/Pixar film, so we have had this on the calendar since the date was released. We saw it Saturday night and I have to say... I was a little disappointed. Nemo had a lot more humor than Dory. And Ellen's voice was so much more ...optimistic 13 years ago. I also don't think this movie flowed as well as Nemo did. That said, I loved the octopus and Sigourney Weaver. And of course the cute otters. I saw it Friday afternoon, and I have to say it was really fun to see it in a theater with a lot of kids. They loved it. Signourney Weaver is a good sport. Also, my primary memory of Finding Nemo is of watching it with my little cousins when they were 3 and 7, and the 7-year-old asking me why I was crying. She is now in college! Time, where does it go? Saw this Sunday afternoon in a packed theater on Father's Day. I like that Pixar continues to precede the feature with a short. "Piper" (about a young sandpiper) was cute but felt more like a rendering POC than a solid story. I didn't like Finding Dory very much, aside from Dory herself. It felt like a series of forgettable chase scenes strung together: an hour after the movie ended, I tried to recall where one specific scene occurred and drew a blank as it could easily been slotted into any of the chase scenes. The characterization of Becky the loon and the third sea lion (Gerald?) really bothered me: not only could they not talk, Becky and Gerald's disheveled appearance and quirky mannerisms were mocked by the talking characters, which was a pretty icky message to impart to a theater full of kids. One of the great joys about Finding Nemo is how almost every character seemed to have a rich, unique inner life and could speak, right down to the krill (Swim away!) Only the antagonists lacked a voice (barracuda, jellyfish, anglerfish and to some degree, the seagulls). Oddly, several key non-villain characters in Finding Dory are mute and as a result, their presence felt plastic and remote. The plot felt a little dragged out - I think they easily could have cut out 20-30 minutes without losing anything. Pretty much everything with Marlin and Nemo, IMO. You could feel everything grind to a halt when their parts were on screen without Dory. I very much appreciated the bit at the end where Marlin learns he doesn't have to treat her as incompetent. She needs some coping techniques but she's not an infant. I should've seen it coming, but I was nevertheless totally unprepared to be bludgeoned in the face with feels when Dory finally found her parents, like ugly-crying-in-the-theatre level feels. Even typing this post, with its total lack of detail, is making me tear up a little bit. Destiny the whale shark was cute, and I enjoyed Hank's repeated disappearing/camouflage act. I also thought that the movie's treatment of Becky and Ralph was a little weird, given the fact that the whole point of the movie was that Dory's disability made her no less valuable or worthy of love as a person (fish). I take some small comfort in the fact that Ralph seems to have gotten the last laugh in the post-credits scene. I liked Destiny, but gosh, it still makes no sense that Dory can speak well from speaking to a whale shark. NONE, unless language works across size and not species! The issue with Becky and Ralph was weird and I think they tried to treat them gently by giving them either heroics (Becky) or victory (Ralph). Becky gets to play a critical role in the climatic action scene of the film and Ralph eventually gets his place on the rock through sheer determination. It doesn't really excuse the other sea lions mocking him or Marlin's unkind words of Becky (which Nemo called him on, though). The movie overall was enjoyable and perhaps only a rung or two under the original film. The animation definitely left the hyper realism of The Good Dinosaur for more traditional Pixar fare. I also expect they wanted the styles to match the original so there wouldn't be much in the way of jarring styles. I think the better ending probably would have been Dory finding her parents home, but not her parents. The poignancy of her seeing how much they loved her through the effort of creating so many lines of sea shells would have been an atomic emotional bomb that would have pushed it into being a greater film, albeit a sadder one. That said, I do like happy endings, which is exactly what we got. When I learned about Finding Dory I was fearful that Dory's personality and character would be a challenge. It's an understatement as to how much I was amazed that not only did they deal with it, but they made it part of the emotional storytelling. Gerald was such a flat character we can't even remember the poor guy's name. The characterization of Becky the loon and the third sea lion (Gerald?) really bothered me: not only could they not talk, Becky and Gerald's disheveled appearance and quirky mannerisms were mocked by the talking characters, which was a pretty icky message to impart to a theater full of kids. Yes, yes, yes. I liked the movie overall, but the treatment of those characters really bothered me. I thought Pixar was better than that, and I wonder how many kids were in the theater this week and felt bad because they saw themselves in the way Gerald was treated. It's especially glaring when the point of the rest of the movie is about how differences (even a severe memory defect!) shouldn't keep people from being valued and respected, or hold them back from significant accomplishments. Gerald and Becky severely undermined that. There were a few good scenes, and the moment when you see that Dory's parents have spent all this time creating long lines of shells to lead Dory home was genuinely moving. I see why it is getting the good reviews that it is, but it doesn't reach the high mark set by Nemo. Another re-write and it could have been better, but the flaws are too glaring as is. I really think they're making a specific point with Gerald and Becky's appearances. Gerald and Becky do not pass the way that Nemo and Dory do; they "look disabled," just as people in the real world do too. But Gerald and Becky have full lives and contributions to make even if they don't pass! Both prove crucial to the story resolution (Gerald provides the pail, Becky proves dependable). Both are victorious in the end (Gerald gets the rock, Becky is a rescuer). People with obvious disabilities, including severe mental disabilities, can be part of the action and should be included! A more thorough comeuppance for the vicious sea lions would have made this clearer for the Gerald character. But someone above mentions a post-credits scene? Did I miss it? Yup. I arrived early for my screening and got to see it without having to wait through the credits. It essentially shows Gerald finally getting his place on the rock. It also touches on one of the open ended questions from the end of Finding Nemo. I'm not sorry I watched Finding Dory but I was definitely hoping for something a little more light hearted and not so much one-long-anxiety-attack-due-to-living-with-a-brain-disorder.